“Traditional mining often sparks controversy. The labors working there are paid low, yet the risk they have to bear is high. 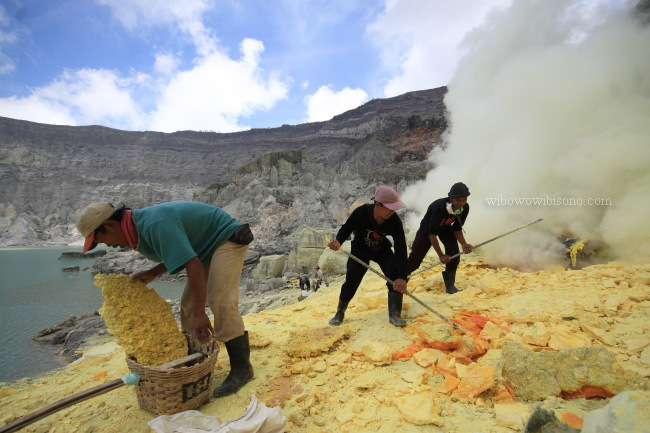 Of many traditional mining in Indonesia, the sulfur mine at Ijen Crater in Banyuwangi, East Java Province, is the most popular and tourist friendly. 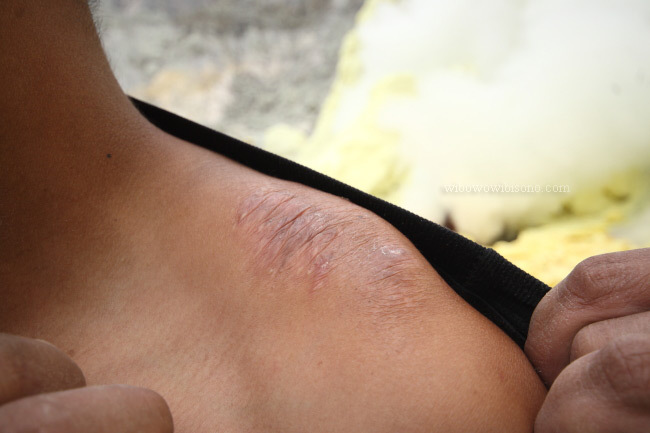 The high demand of sulfur for pharmaceutical industry has driven hundreds of local men down to the bottom of the crater to mine it. 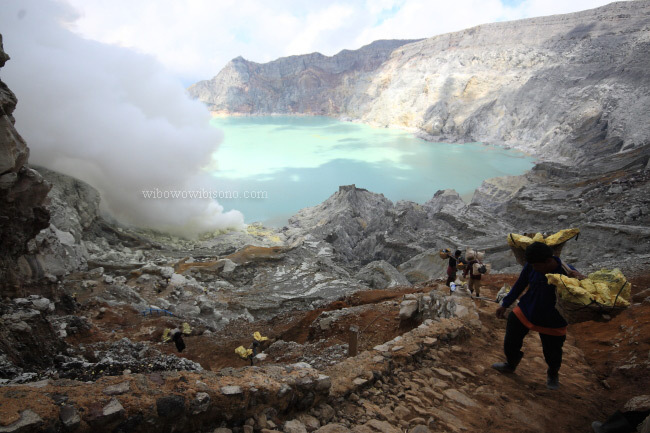 Being in the bottom of Ijen Crater, some thousand meters depth, surrounded by volcanic rock cliffs, I soon realized that it was not a nice place to work. 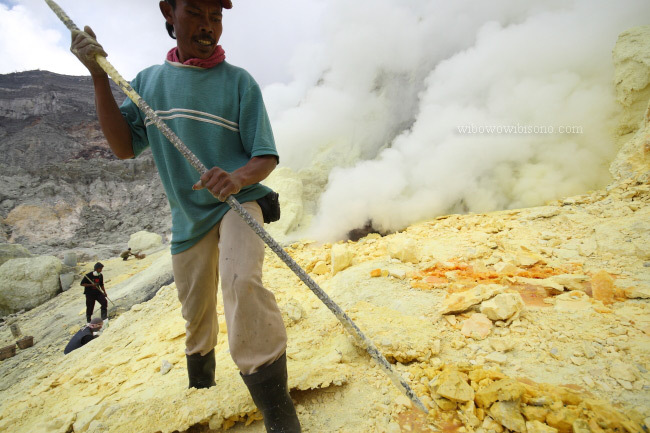 The sulfur gas that kept blowing from the ground would quickly irritate your eyes and hurt your nose. Your lungs would be immediately filled with the gas and that would, of course, gradually degrade your respiratory. During the one hour I spent in the bottom of the crater, I couldn’t help but coughing nearly all the time. To me, it was absolutely a miserable condition. To the miners, it was something they had to cope with everyday. Most miners started working in the early morning, even before dawn. The whole mining process began in this crater. 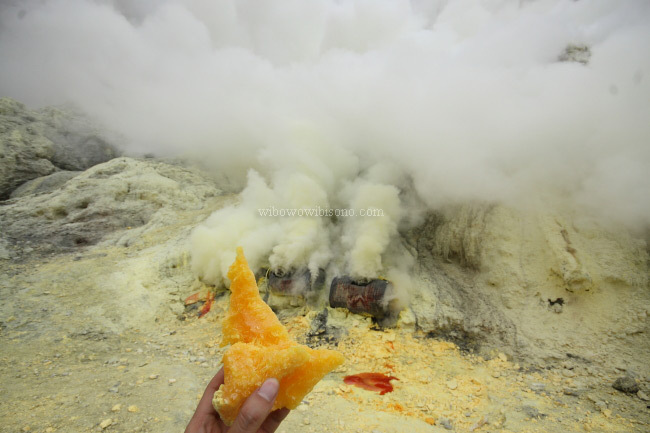 Naturally, the sulfur came out in the form of gas which was channeled through what looked like pipes and condensed into liquid due to the high pressure inside the pipes. It didn’t take too long for the liquid to change into solid rocks as it came out from the pipes. The miners broke the rocks with crowbars into smaller chunks and uploaded them to bamboo baskets or plastic sacks. They had to carry those heavy loaded baskets and sacks in their shoulders after that. To make sure that they could carry the load, they had to pass the test of strength. At least that’s what I guessed when they put the load on two columns and tried to lift it on their shoulders. 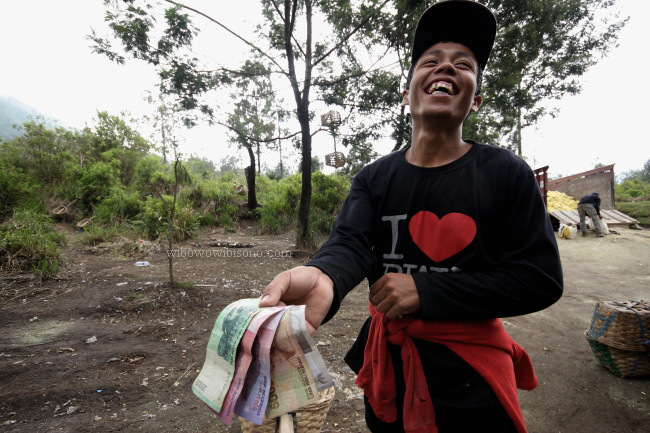 Another activity I found in the bottom of the crater, besides mining, was handicraft making. I met Pak Budhiono who was pouring the liquid sulfur into some molds shaped like turtles, Hello Kitty figure, flower, and heart. Most of these handicrafts were sold as souvenirs. It was funny however to find this kind of activity in a male dominated environment where the hardship of life was literally defined with rocks and heavy loads. Leaving the crater with heavy load in their shoulders, the miners had to climb up the unpaved path, - in some place, it was covered with huge chunks of stones which could be very slippery when it rained, and then walked few kilometers to reach a post. This could take about forty five minutes of walking. To keep the loads in balance, a miner constantly switched the loads from one shoulder to the other one. 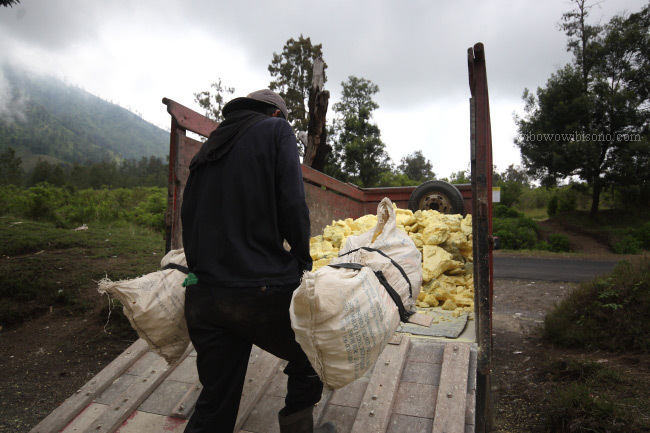 As they reached the post, first thing they did was put the bamboo baskets or plastic sacks loaded with sulfur rocks in an old manual scale and weighed them. The heavier the loads, the more money they could earn. 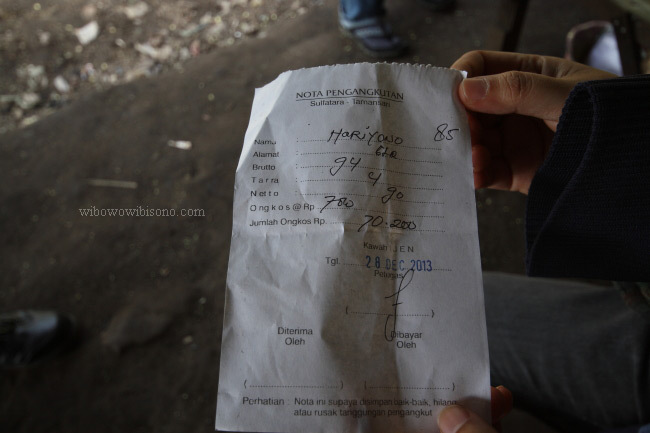 Last time I came to this place, for every one kilogram of sulfur rocks, the miner got paid seven hundred and eighty rupiah. 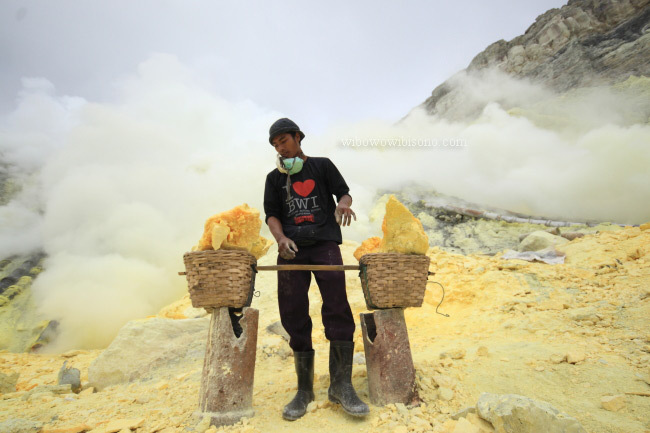 Most miners mined the sulfur twice a day. 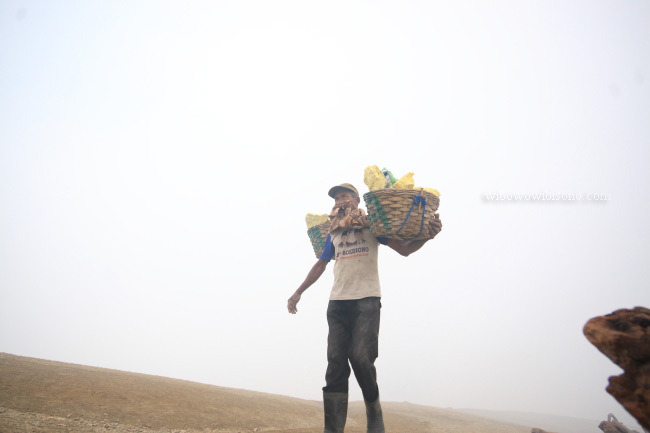 Each time, the maximum load they could carry was up to one hundred kilogram. But in average, most of them could only carry seventy kilogram. Standing close to the post where miners do the weigh in process, there was a small wooden hut, painted in green. It was a shelter for miners who wanted to take a break from the hardship of work. I stepped inside the shelter and met Pak Mardjuki who was very friendly and gave me a warm welcome. 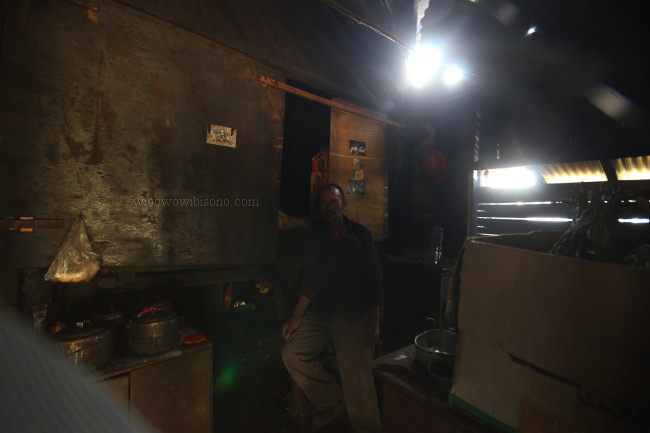 I later learned that the shelter consisted of kitchen (they cooked with firewood) and some bedrooms that appeared to me like caves as it was completely dark in there. Except for the heavy loads that would surely hurt the shoulders, I could say that the rest of the step a miner had to go through after the weigh in process was less miserable. Leaving the post, they still had to walk kilometers away, ups and downs, through the woods. Many times, a miner had to pause just to take a breath or release the tension in the muscles caused by the loads. About forty minutes walking from the post and shelter, I arrived at the last post where miners traded the sulfur rocks for some cash. They put the entire load they had carried on the ground, and waited for their names to be called by an old local Chinese man sitting inside a bamboo hut who seemed to be the boss. And they, yet again, had to weigh the loads on some old rustic manual scale which I doubted about the accuracy. 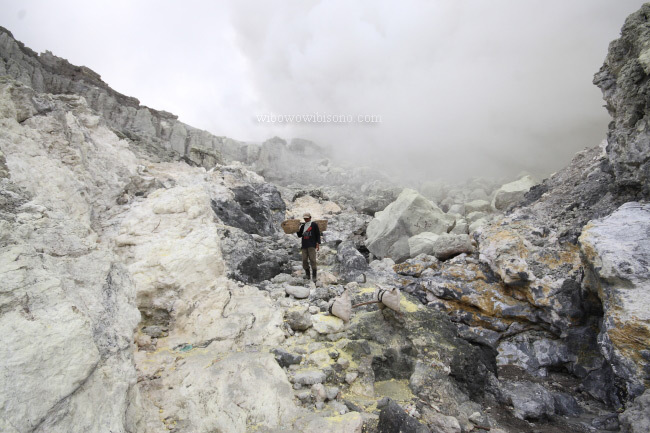 At the end, all the sulfur rocks were uploaded to a truck that would carry them to the factory for early stage processing. I am not like those who work in humanitarian bodies or charities who struggle for the betterment of unfortunate labors such as these miners. 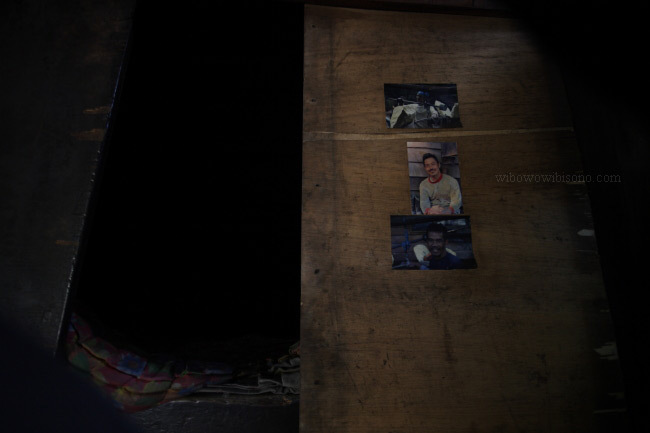 But I do really hope that with this brief story, together with the pictures, I can create a better understanding that somewhere in the island of Java, there are some people risking their life, not only for the betterment of themselves, but also of many people they never meet.